Many offices require printers than can print color documents, but often those jobs are offloaded onto separate devices for reasons of cost and efficiency. 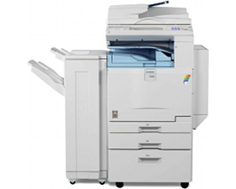 The Gestetner DSc-424 allows small-to-medium offices to consolidate their printing needs and operate from a single device: it is a full-color copier, printer, and scanner ready for industrial use and designed for expansion. The 187-pound copier measures 21.65" x 26.85" x 30.75". It is likely too large and too heavy to fit on a desk, but it would fit comfortably on a credenza or another piece of furniture able to bear a heavy load. The DSc-424 has a resolution of 600 dpi and extremely adjustable zoom settings, allowing for users to shrink or magnify documents between 25% and 400% in 1% increments. It can store relatively large amounts of data in its 768 MB of RAM or on its 40 GB hard drive, much larger than many similar devices, and can produce up to 100 copies at a time. The DSc424 both prints and copies black and white documents at 24 pages per minute and full color documents at 10 pages per minute. 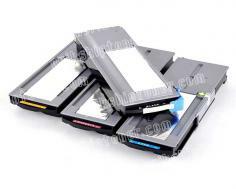 The DSc424 comes with two 250-sheet trays capable of holding paper between A6 and A3 in size. There are several options for expansion, including 500-sheet trays, a 2000-sheet large capacity tray, and a 100 sheet multi-bypass tray for A3+ paper, with a maximum quantity of 2600 sheets of paper. Additionally, the copier can staple finished jobs up to 50 pages thick. The scanner can scan a maximum of 45 original documents per minute at a maximum of 1200 dpi. Its included Scan-to-Folder functionality allows users to scan documents and easily send them to specific folders across a local area network or to an FTP server. Scan-To-Email allows the copier to send scans directly via SMTP to a maximum of 500 addresses per job, and can maintain an address book either via LDAP or on the copier's hard drive. The DSc424 allows the printer's settings to be accessed through a web browser, making it possible to check the copier's status and change administrative settings without installing any additional software or drivers. The copier supports TCP/IP, IPX/SPX, SMB, and AppleTalk protocols. There are many other options to expand the copier's functionality, including a reverse document feeder, bridge and duplex units, a number of additional ports (IEEE 1284, FireWire, 802.11b, Bluetooth, an additional G3 port). USB 2.0 and Ethernet 10 base-T/100 base-TX are included standard. Fax functionality is available as an add-on, allowing for either telephone or internet-based faxing at 200 or 400 dpi. Working in color slows down the workload considerably, as in both copying and printing functions the DSc424 slows from 24 copies to 10 copies per minute. Though this is a considerable slowdown, the speeds for grayscale copies and prints are beyond industry standard at 24 pages per minute. Offices that run through large quantities of paper daily -- more than a single ream -- will almost definitely need to expand upon the two 250-sheet trays included standard with the printer, especially if they intend on making the DSc424 an all-in-one solution for printing and copying. The 40GB hard drive included as part of the copier's memory introduces another moving part and another potential point of hardware failure to the device that many other printers and copiers don't have, as many devices solely function from RAM. While this is by no means a deal breaker, it is something to consider when choosing the DSc-424, as solid state media is by design more reliable. Review it: "Gestetner DSc-424 "
The DSc-424 requires four separate cartridges for black and color printing, with color printing split between cyan, magenta, and yellow cartridges. 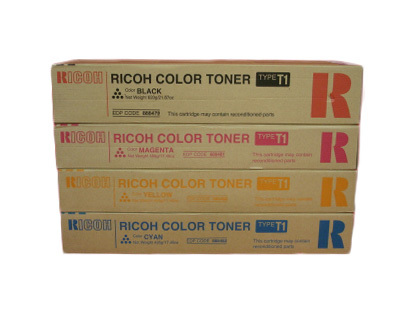 The copier ships with starter cartridges at a 2000-sheet capacity at 5% coverage, much smaller than its replacement cartridges. Black cartridges yield 25000 sheets at 5% coverage, while cyan, magenta, and yellow cartridges yield 17000 sheets at 5% coverage each.